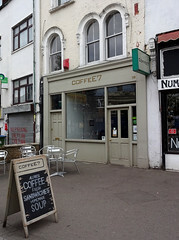 CoffeE7 was a vegetarian cafe in Forest Gate. It closed down in July 2017. Vegetarian cafe in Forest Gate. It's larger than it looks from outside, with a long, narrow interior providing several distinct seating areas. At the front is a fairly standard cafe area with service counter. A corridor leads back from here, past a cosy sofa-filled nook, then opens out to a space lined with church pew style seating. Beyond this is a small walled garden. The decor is stripped-back, with worn flooring, exposed brickwork, and slabby, plank-built tabletops. Feature walls are covered with chipboard and distressed painted planks, and original art hangs here and there photo. Kake visited on a Tuesday afternoon in August 2016. There were 8 or 9 other customers when I arrived around 2:30pm. Relaxing music was playing, not too loud. A pot of orange rooibos tea (£1.80) was generously sized. The tea itself was loose-leaf, placed inside a hand-tied filter bag inside the pot to avoid the need for a strainer, and had a good clean flavour with just enough orange to add interest. I ordered and paid at the counter, and my tea was brought to me. No service charge was added. They have free wireless, with the network name and password chalked on a board above the service counter. Dog-friendliness: According to their website as of August 2016, they welcome "well behaved" dogs. Child-friendliness: They have at least two highchairs and at least two child-sized upright plastic chairs as well. There are nappy-change facilities in the accessible toilet. Accessibility: No step to get in, just a small ridge at the threshold. A higher ridge at the entrance to the garden, about an inch and a half up and immediately down again. Step-free to toilets, including an accessible one with nappy change. Last edited 2018-03-12 14:09:29 (version 3; diff). List all versions. Page last edited 2018-03-12 14:09:29 (version 3).